Photo captures bear lying in hammock. Yes, even black bears like to take a break every once in a while. Rafael Torres snapped photos of this bear lying in a hammock in a Daytona Beach, Fla., neighborhood Thursday. Torres told ABC affiliate WFTV in Orlando that the bear wandered through the neighborhood before climbing into the hammock. He said the bear stayed there for about 20 minutes, then headed back into the woods. 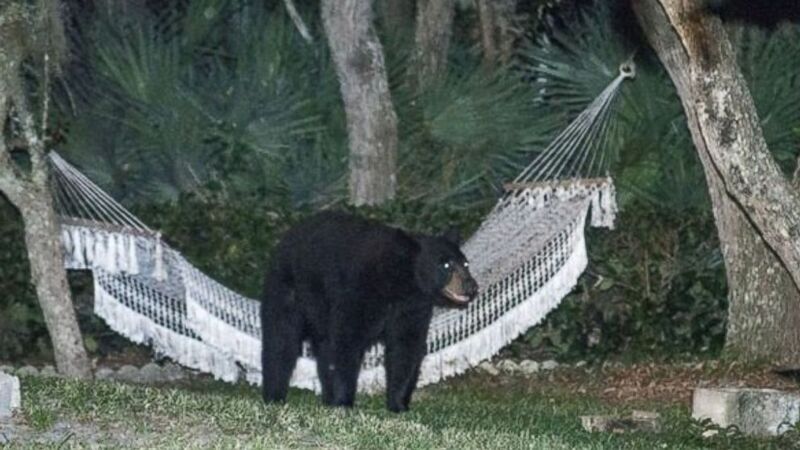 (Courtesy Rafael Torres/Photos from WFTV) After making its way through a Daytona Beach neighborhood Thursday, May 29, 2014, a black bear took a moment to rest on a hammock before ambling back into the woods.